1228, Used Rims, 15X7, 6 LUG, 5-1/2", 79-91, CHEVY, TR,4X4, GMC, TR, 4X4 BLAZER, JIMMY, TRUCK, SUBURBAN. ALUM, 8 HOLE. 1228, Used Rims, 15X7, 6 LUG, 5-1/2", 79-91, CHEVY, TR,4X4, GMC, TR, 4X4 BLAZER, JIMMY, TRUCK, SUBURBAN, 8 HOLE, ALLOY. 1311, Used Rims,15X6, 5LUG, 4-1/2", 83-90, FORD, RANGER, BRONCO, 5 SPOKES WITH V PAINTED DARK GRAY IN V & SPOKES, HAS 2 SCREW HEADS ON EACH V, ALLOY. 1423, Used Rims,15X7, 4 LUG, 4-1/4",85-93, FORD, MERC, CHEV, CAPRI, COUGAR, MUSTANG, THUNDERBIRD, ALUM 10 HOLE. 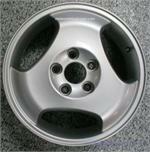 1423, Used Rims, 15X7, 4 LUG, 4-1/4", 85-93, FORD, MERCURY, CAPRI, COUGAR, MUSTANG, THUNDERBIRD, 10 OPENINGS, ALLOY. 1428, Used Rims, 15X6, 5 LUG, 115mm, 85-90, BUICK, ELECTRA, PARK AVE, LESABRE, RIVIERA, 15 SLOT, ALLOY. 1445, Used Rims, 15X6-1/2, 5 LUG, 5", 85-93, CHEVY, GMC, 10, 20, 1500, 2500, VAN, 8 HOLE, ALLOY. 1475b, Used Rims, 15X6, 5 LUG, 4-1/4", 86-91, FORD, MERCURY, SABLE, TAURUS, LACE DESIGN, DULL FINISH, ALLOY. 1475d, Used Rims, 15X6, 5 LUG, 4-1/4", 86-89, MERCURY, SABLE, LACE DESIGN, WHITE, ALLOY. 1489, Used Rims, 15x6, 5 LUG, 115mm, 86-90, OLDS, TORONADO, CUSTOM Cruiser, SOME '86 HAVE ACCENT STRIPE, LACY SPOKE DESIGN, ALLOY. 1558, Used Rims, 14X6, 5 LUG, 4-1/4", 88-89, EAGLE, PREMIER, X SPOKE DESIGN, ALLOY. 1578, Used Rims, 12X4-1/2, 4 LUG, 4-1/2, 88-90, FORD FESTIVA, 8 TEAR DROP POCKETS, ALLOY. 1594, Used Rims,14X6, 4 LUG, 4-1/4", 88-92, FORD TEMPO, 39.4mm OFFSET, 7 SPOKE, ALLOY. 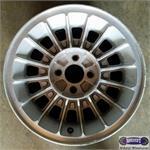 1594, Used Rims, 14X6, 4 LUG, 4-1/4", 88-92, FORD TEMPO, 39.4mm OFFSET, 7 SPOKE, ALLOY. 1626L, Used Rims LEFT, 17X9-1/2, 5 LUG, 4-3/4", 88-89, CHEVY, CORVETTE, LEFT SIDE, 6 SPOKE, ALLOY. COMES IN NATURAL OR WHITE. 35TH ANNIVERSARY MODELS ARE PAINTED WHITE. 1629, Used Rims, 14X6, 5 LUG, 115mm, 88-91, OLDS, CIERA, CUTLASS, SILHOUETTE, LACY SPOKE DESIGN, ALLOY. Price: ORDER UNDER # 6527C CENTER CAP.